The 2018 Dodge Challenger in Albuquerque has enough old-school swagger to please most car enthusiasts. For the model year, Dodge offered 16 different trims, from the somewhat sensible SXT to the high-performance SRT Demon. While the Demon got most of the publicity, the manufacturer also offered a wide-body kit for the Challenger Hellcat, as well as a standard backup camera and optional Brembo brakes on the R/T model. Why LEASE a 2018 Dodge Challenger? Read on to find out about our great lease offers at Melloy Dodge, our dealership serving Albuquerque Santa Fe Los Lunas New Mexico. With vintage-style sheet metal, the Challenger offers plenty of throwback style. Circular headlights and other design cues further reinforce the 1970s look, and its graceful, long hood gives it a shark-like appearance. The 2018 Dodge Challenger is connected to the asphalt by standard 18" wheels. Base Challengers come with auto halogen projector headlights, LED taillights, a dual-vent hood, a deck lid spoiler, and heated adjustable side mirrors. Optional upgrades include rain sensing wipers, power folding mirrors, fog lamps, power sunroof, HID headlamps, and 19" or 20" wheels. Why LEASE the 2018 Challenger? Stop by to find out about the great lease offers at Melloy Dodge; we're now serving Albuquerque Santa Fe Los Lunas New Mexico. Although it only has two doors, the 2018 Challenger has plenty of passenger room in front and in back. The cabin has a full center console with plenty of room for device storage. In the back, the trunk offers 16.2 cu. ft. of cargo area. 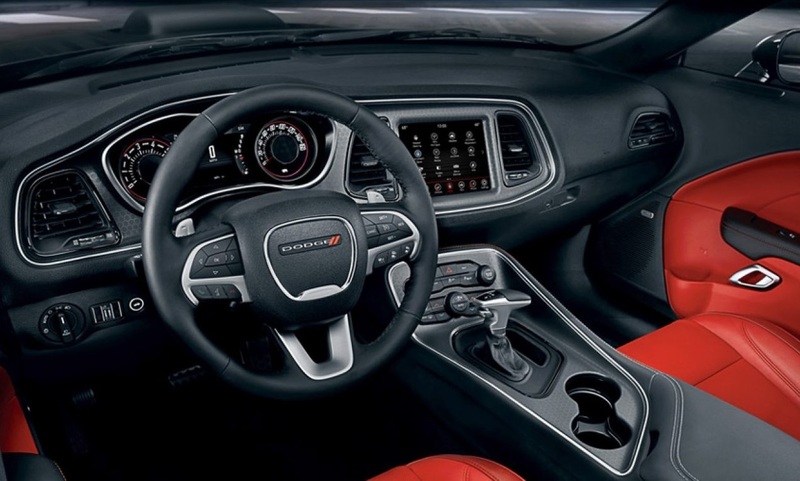 Standard interior touches include dual climate controls, a power adjustable seat for the driver, manual-adjustment tilt/telescoping steering column, a leather-covered wheel, 60/40 split rear seats, and black safety belts. Available upgrades include red safety belts, ventilated and heated front seating, power-adjustable steering, a heated wheel, and leather upholstery. On the inside, the 2018 Challenger throws it back to the 1971 model year. The dashboard is canted toward the driver, and flows quite nicely into the aforementioned center console. Available houndstooth upholstery on some Challenger models completes the old-school look, but there's plenty of technology here, too. While the 2018 Dodge Challenger in Albuquerque may look a bit mean, it's shockingly tame behind the wheel. Although you'll get different suspension and steering components depending on the trim level you choose, it's an easy and comfortable vehicle to drive. The Challenger's mass is quite considerable, but it makes for a commanding presence on the highway. Sportier Challengers are, as you might expect, more precise, but there's no denying the Challenger's heft when it's driven as intended. 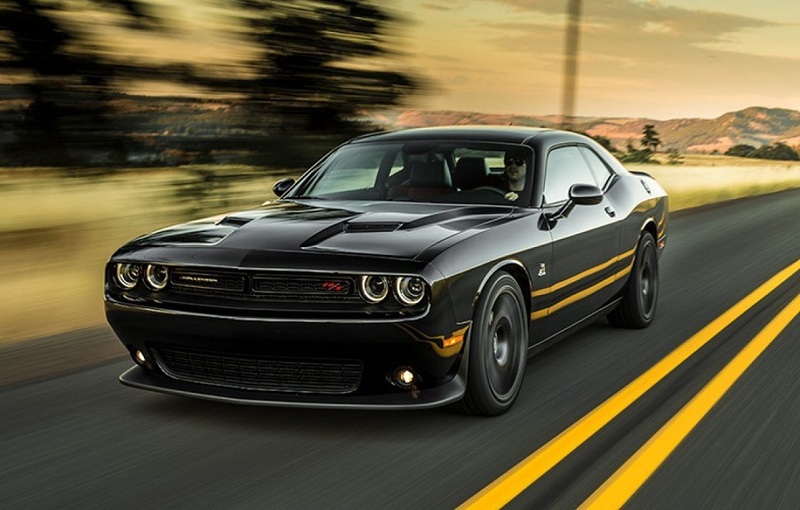 With the 2018 Challenger, brisk acceleration is just part of the awesome package. However, you won't have to sacrifice road manners to get it. 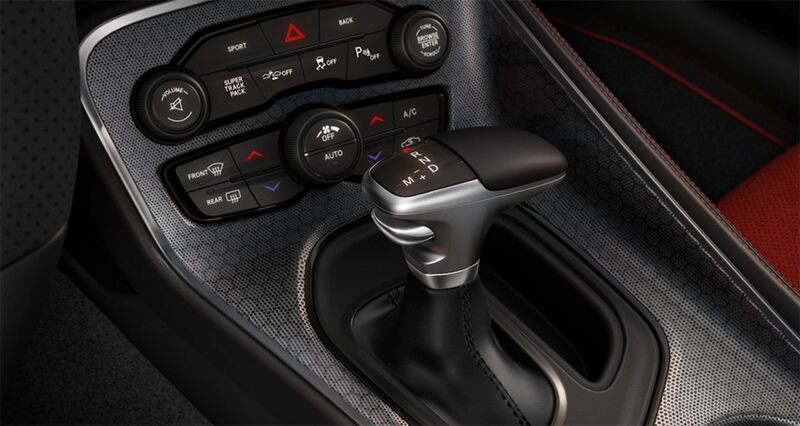 You'll be able to choose from a six-speed manual and an eight-speed auto. RWD is standard equipment, and GTs come with AWD for better handling on slick roads. The 2018 Challenger's bottom-tier engine is a 3.6L V6 that puts out 305hp and 268 lb. ft. of torque. That's followed up by a 5.7L V8 with 375hp and 410 lb. ft. There's a supercharged 6.2L V8 with a whopping 707hp and 650 lb. ft. of torque. Demons come with a roaring, supercharged 6.2L V8 that offers an astounding 840hp and 770 lb. 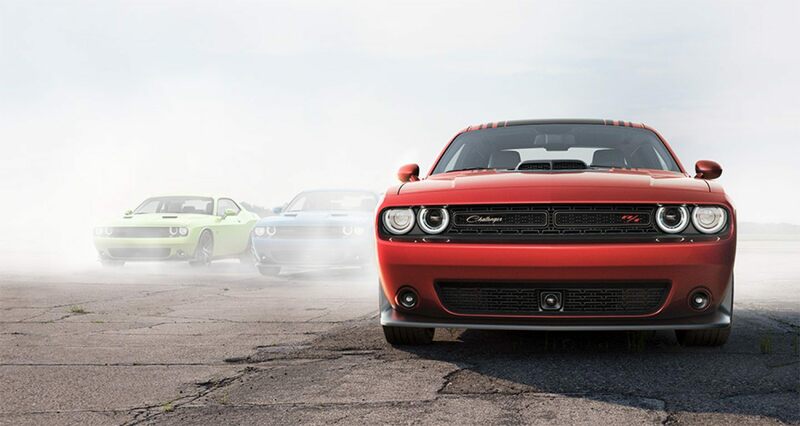 ft. No matter which Challenger you choose, you're guaranteed to have a good time with every drive. Standard safety featuers include six airbags, stability control, and a rearview camera. Forward collision warning, rear cross traffic alert, and blind spot monitoring are available. There's an optional Technology Group that combines forward collision warning, auto wipers and high beam headlights, and adaptive cruise control; however, auto emergency braking is notably absent. In government-sponsored crash tests, the Challenger got a five-star overall rating. The IIHS gave it the top rating of Good in side crash and moderate overlap testing, and it got an Acceptable rating in roof strength testing. Stop by today to see all these safety features and options for yourself. 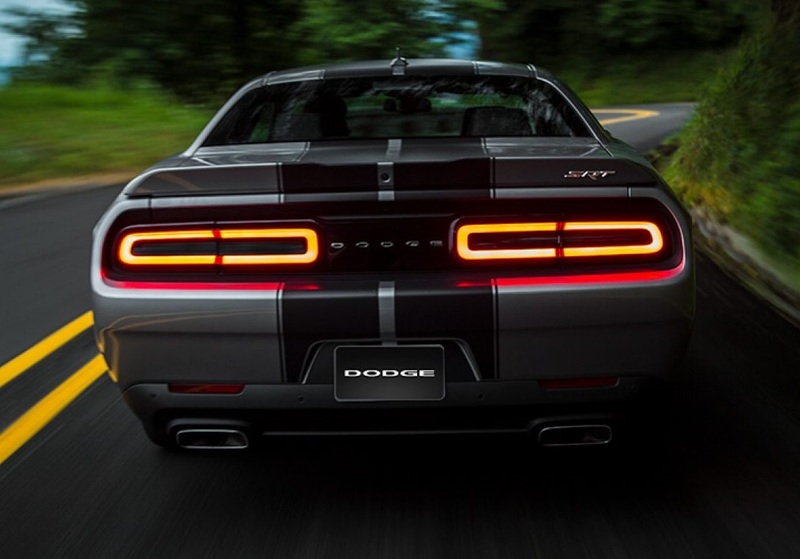 The 2018 Dodge Challenger in Albuquerque has an undeniably racy look, and if you choose the right powertrain package, it has the street and strip performance to back it up. Why LEASE the 2018 Dodge Challenger? Stop by to find out! Call us to find out about our lease offers at Melloy Dodge, see our inventory on our website, or visit our showroom to take a test drive. We're proud to be serving Albuquerque Santa Fe Los Lunas New Mexico, and we hope we can help you find the Challenger model that meets your needs. We look forward to seeing you soon!